Frontend and backend development guru, lover of all things computer... and cats! 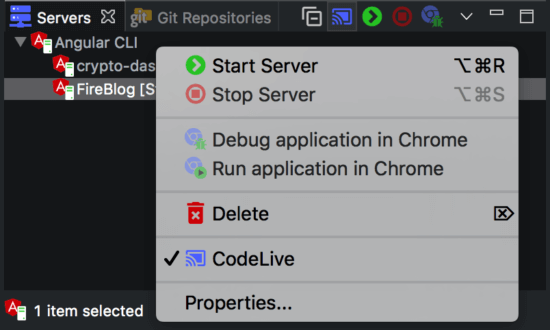 Hopes to make your coder life a breeze by sharing some tips and tricks of the trade. Posted on Jul 12th 2018 We will continue from where we left off in the first article. 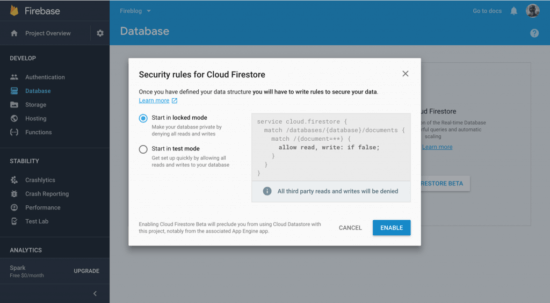 In this part of the article, we will add the markdown editor for authoring posts on our blog, and we will set up Firebase for authentication and persisting data to remote storage. Let’s get started! Open the Firebase console and sign in to your Google account. 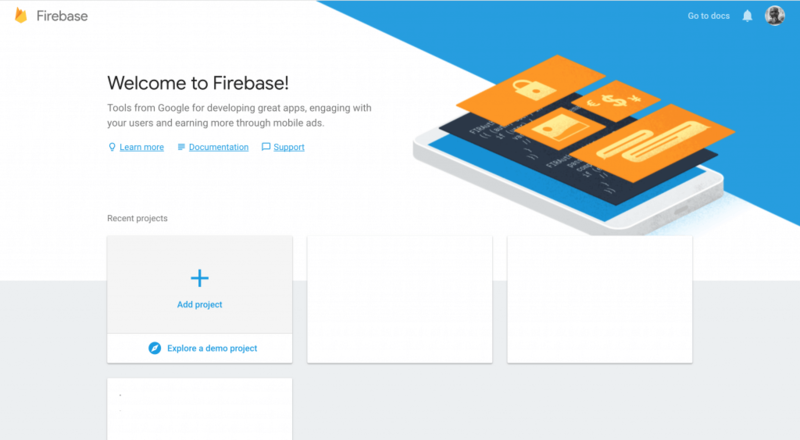 Click on Add project in order to create a new Firebase project. 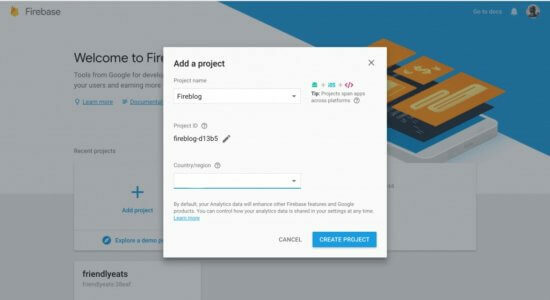 Next, enter Fireblog as project name, select your Country/region and click Create project. 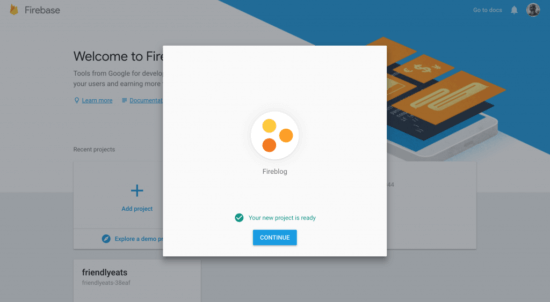 A screen should pop up telling you that your new project is ready; on this screen, click Continue. Now you should see the project overview page. 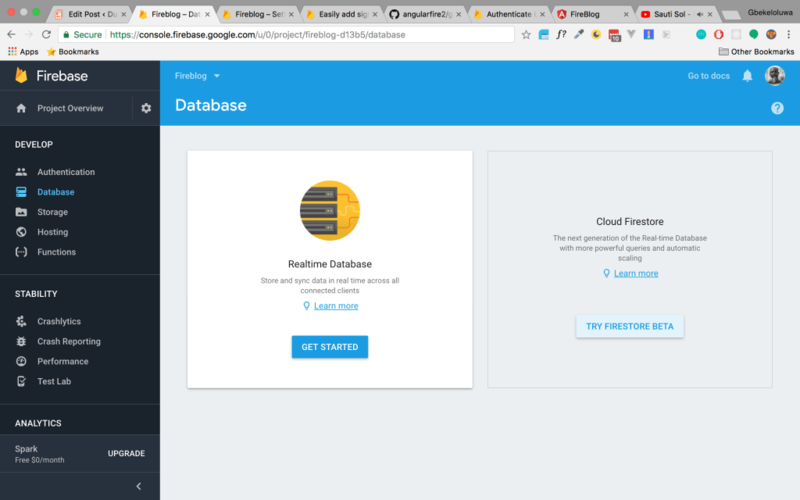 On the project overview page, click Add Firebase to your web app, copy the value of the config variable, which is a JSON object, and set it as the value of the key Firebase in /src/environment/environment.ts and in /src/environment/environment.prod.ts. Click on the Database menu to the left, and then choose Try Firestore Beta. On the next screen shown below, choose locked mode and then click Enable. On the next screen, click Add Collection and name the collection posts. Then, add 2 fields of type string (title, content), and provide them with some initial value. Then, click Save. These are very simple rules for learning purposes and are not recommended for production apps. In the code snippet above, we define a class EditorAuthGuard which implements CanActivateChild imported from @angular/router. CanActivateChild is an interface that a class can implement to be a guard deciding if a child route can be activated. In the constructor for EditorAuthGuard we inject afAuth an instance of angularfire2/auth/AngularFireAuth, and router an instance of @angular/router/Router. The class has a method canActivateChild that checks if a user is logged in. 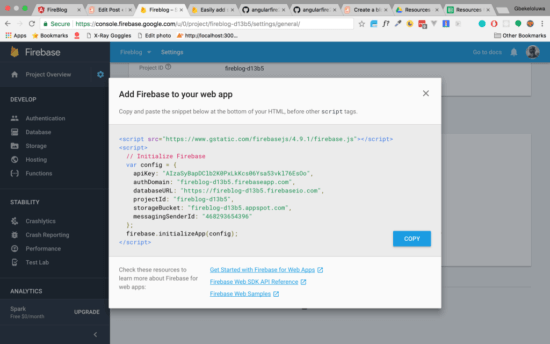 In the code snippet above, we use methods provided by AngularFire2 to implement Login with Google functionality. In the code snippet above, we have added route rules for the /auth routes, and imported EditorAuthGuard and set it as a route guard for the /editor routes. The route /editor/posts should allow us to create a new post and show a list of posts that have been created in the blog. Update the editor-posts component to enable this functionality. In this view, we have two sections. The top section provides a form for creating a new post by typing in the title in the input box and hitting Enter. Notice that we bind the keyup.enter event to the component instance method onEnter. content: "Create a post Luke"
Using CSS we are displaying the text “Create a post Luke” when the user is yet to create a post, and the list of posts is empty. In the constructor of EditorPostsComponent, we inject afs an instance of AngularFirestore. Instance variables postsCollection and posts are then assigned values. The onEnter method takes new_post_title as a parameter, we then create a new Post object which is used as an argument to the addItem method. 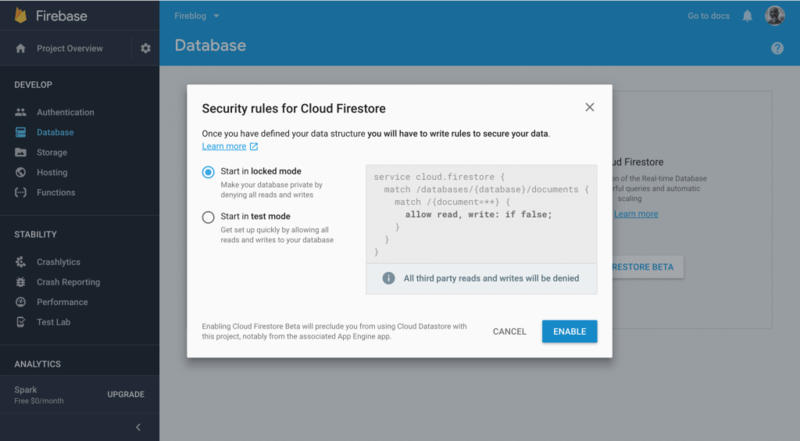 The addItem method uses the add method of AngularFirestoreCollection to persist the new Post object to the Firestore backend. In this markup, we have a simple form to edit the title and content of a single post; all changes made are auto-saved. Notice that we bind the change event to the update method. The getPost method simply gets a post from Firestore using the postId parameter. In ngOnInit, we observe this.route.paramMap so we can retrieve the post id from the route parameter, after which we call the getPost method. The getPost method assigns an AngularFirestoreDocument to the instance variable postDoc. We then observe the document, so that once its value is available, we assign it to the class variable formModel. The update method serves to persist the changes to our post document via the AngularFirestoreDocument update method. In the constructor ReaderPostsComponent, we inject afs an instance of AngularFirestore, we use the collection method from AngularFirestore to create an instance of AngularFirestoreCollection stored in the variable postsCollection. We then create an observable which will return the array of posts to the posts instance variable. In the constructor, we inject afs and route. In the ngOnInit method, we observe route and execute the getPost method, once the route parameters are available. 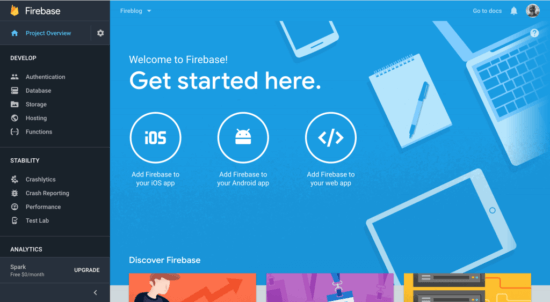 In the getPost method, we get the post to be displayed from Firestore. In the Server window, right click on FireBlog and click the green icon with label Start Server. Now open http://localhost:4200/ to see the running version of the blog.